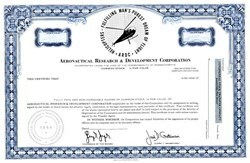 Beautifully engraved specimen certificate from the Aeronautical Research & Development Corporation. 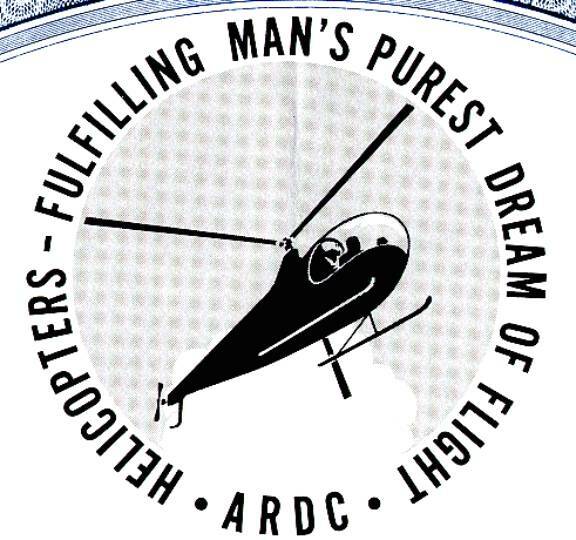 This historic document was printed by the John A. Lowell Banknote Company and has an ornate border around it with a vignette of a helicopter, with the saying "ARDC - Helicopters - Fulfilling Man's Purest Dream of Flight" written around the image. This item has the printed signatures of the Company�s Chairman of the Board, and Clerk/Secretary, J.D. Gateman. Brantly HelicopterThe company started out 1945 as Brantly Helicopter Corporation in Philadelphia, Pennsylvania, founded by Newby O. Brantly. Brantly was so impressed with the Sikorsky VS-300 that he decided to design his own helicopter. In 1946 his first helicopter, the Brantly B-1 with coaxial rotors made its first flight. The B-1 was not put into production. Using lessons learned from the B-1, he decided to build a two-seater with a simple rotor design. This helicopter, the Brantly B-2, made its first flight 1953. In 1957 the company moved to Frederick, Oklahoma, where the B-2 was certificated in 1959. He later designed the Brantly 305, a five-seater which made its first flight 1964. It was certificated by the FAA in 1965, the same year it entered production. Lear Jet acquired the Brantly Helicopter Corporation in 1966; at this time the 180,000 sq ft (17,000 m2) factory in Frederick, Oklahoma had 100 employees. The factory moved to Wichita, Kansas in 1969. Aeronautical Research & Development Corporation (ARDC) bought all the rights to Brantly helicopters from Lear Jet in 1969, but they ended operations in early 1970. Brantly-HynesIn 1972, the rights were acquired as Brantly Operators Inc. by Michael K. Hynes. He renamed the company in 1975 as Brantly-Hynes Helicopter Inc. Later that year, the Franklin Capital Corp, headed by F. Lee Bailey who also owned Enstrom Helicopter Corporation at that time, purchased the company. Brantly-Hynes originally were just providing product support but later placed the B-2 and 305 back into production. Brantly InternationalThe new factory in Vernon was built 1989 by Japanese-American businessman, James T. Kimura, who renamed the company as Brantly International. In 1996, they achieved the FAA production certificate. In 2007, a joint venture between Brantly International Inc, Qingdao Wenquan International Aviation Investment Co., Ltd, and Qingdao Brantly Investment Consultation Co., Ltd. was established. The Aerospace Industries Association (AIA) statistic for US Civil Helicopter Shipments between 1981-2007 showed 12 delivered B-2Bs. The factory at the Wilbarger County Airport plans to closed the plant at the end of 2010 and move the company moved to Coppell, Texas. Qingdao Haili Helicopters Co. Ltd. is now the only manufacturer of the B-2B helicopter.